This post contains affiliate links. We are participants in the Amazon Services LLC Associates Program, an affiliate advertising program designed to provide a means for us to earn fees by linking to Amazon.com and affiliated sites. Since we have an affiliate account with Amazon we receive a few pennies when an item is purchased through our links. There is no additional charge to you, and it helps keep the lights on. Thank you for shopping with us! Renting a kayak when we travel is a good option. There's nothing as serene as paddling along a quiet coastline, across a placid lake, or down a lazy river. I know there are some who love the excitement of whitewater with its navigational strategy, thrilling twists, turns and jumps but the calm waters are a better platform to observe wildlife - instead of being the wildlife! Quiet water paddling is what we like to do as we travel across the county so we look for campgrounds near lakes or bays to drop in the kayak and enjoy the scenery. Initially, we began our paddling adventures with a canoe. But soon found that its length and weight made transporting it unwieldy. So, I looked at kayaks, admiring their sleek, lightweight frames. They would be so easy to carry to the water! 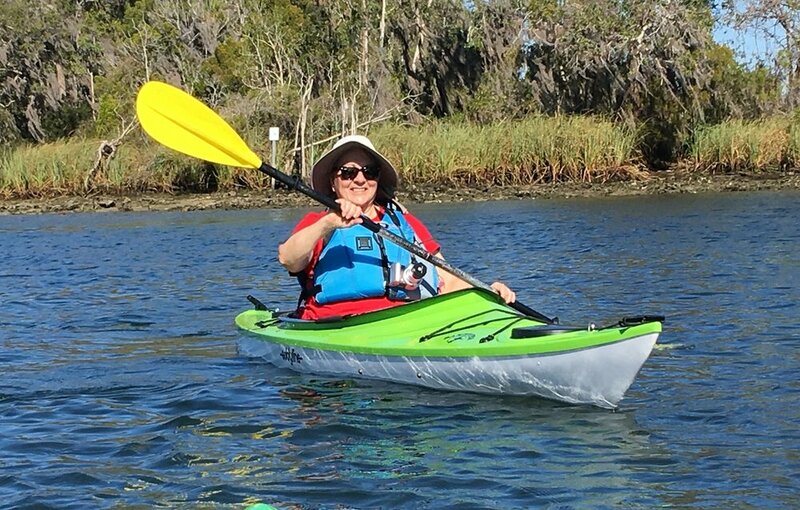 Wildlife is better observed from a kayak- like this manatee! But when we began traveling in a small RV we knew the hard-shell kayaks would be too big to take along. We figured the answer would be to rent kayaks when we were traveling. That is until I happened to see an ad for a Sea Eagle inflatable kayak. The ads, of course, made them seem perfect. I was not so easily convinced and had a lot of questions about inflatable kayaks. The Sea Eagle inflatable kayak was sounding like a good candidate as my RV travel kayak. The next hurdle was seeing how my budget would fare compared to renting hard shell kayaks while traveling. These are our two solo kayaks from Sea Eagle replacing our old tandem. They fit in the RV storage compartment along with our camping gear. Though our comparison ended in a tie, we decided on purchasing a Sea Eagle 370 tandem kayak. It tracked pretty well with its two parallel skegs holding our heading with gentle but continual course correction. It is rated for lake paddling as well as ocean and river paddling. It packs down to a 26 lb. package tucked into a canvas duffel bag that fits neatly into the back compartment of the RV. Inflating it was a quick and simple affair with a supplied foot pump and inflation gauge. It takes about ten minutes to inflate the kayak and seats. Ah, yes, the seats. We ordered the upgraded seats and I am glad we did. They offer good support in the seat and back and have zippered and flapped pockets to store small items. As for durability, we discovered the material is quite durable. It is vinyl cloth fabric with a high puncture resistance. Unfortunately, we have had two punctures, both due to a broken bottle at a beach launch, but the supplied repair kit worked perfectly and we were back on the water the next day. The initial cost was quite reasonable and we have easily paid less than we would have if we had rented kayaks. I think we paddle more frequently because we don't have to rent. We have enjoyed the kayak so much that we sold our Sea Eagle 370 tandem kayak and purchased two Sea Eagle 330 one-man kayaks. The solo 330 kayaks give us a bit more flexibility and allow us to paddle into shallow water. We can also 'raft-up' and have lunch or relax with two single kayaks! Needless to say, Sea Eagle won our business. We like the size, the handling, and the price of their 330 and 370 models. Easy to store, inflate, and paddle, both models are great traveling companions for our RV. Shop around. There are many brands and types of inflatables and the prices can vary significantly. Check the reviews and investigate the company's website, social media and customer testimonials. Make a list of criteria for your purchase. What are the most important features for your type of use? Although we thought transporting was a key criterion, that may not be as important to you. How will you use the kayak? Are you mainly in quiet water or thinking of whitewater adventures? There are inflatables that can handle whitewater but they tend to be a bit pricier than quiet-water models. Check out the specifications for your inflatable kayak. Find out about how to inflate them, the durability of the fabric, the optional equipment available, and how to repair a puncture or tear. What is included in the purchase price and are there other necessary items to add to that price? Don't forget to buy life vests, throw ropes, dry bags, and water shoes! After we inflate the kayaks, we place a chamois-type towel on the floor to soak up any water. They are easy to wring out and keep the kayak floor dry. If we are going to paddle in rough water (like the ocean) we leave the drain plug open. If we are paddling in quiet water (like a lake or river) we leave the drain plug closed. We attach our throw ropes to the built-in hitch on the bow of the kayak. A throw rope is invaluable to hold onto the kayak in fast moving water or windy conditions. We also use them when rafting-up. But the most important reason to have a throw rope is to use it as a rescue line. If you get in trouble kayaking, having a throw rope allows others to help pull you out of harm's way. Never forget approved life vests with a whistle attached. In many places, it is the law! We change into water shoes when we reach the launch - they just make it more comfortable walking on rocky or muddy launch areas. They are lightweight and dry quickly. Watch out for broken glass or metal shards in your launch area. Throw in the dry bag just before getting into the kayak. Our dry bag includes a hat, sunscreen, bottled water, snack bar, and a quick-dry towel. We stash our keys and phones in a water-tight floating box that is stowed in the dry bag. As for a camera, a Go Pro has a water-tight case and takes pretty good video. If you are a phone-camera aficionado like me there are waterproof cases for phones too. Kayaking is such a great way to experience water destinations. Whether you choose to rent kayaks or purchase your own, there is an option available to get you onto the water. We are enjoying our new Sea Eagle 330 kayaks and take them with us everywhere we camp. They have paddled Penobscot Bay, Lake Blue Ridge, and the Gulf of Mexico without problems or punctures. Yet we have also rented kayaks for guided tours. Both have their place in our travel plans. If you have questions on inflatable kayaks just list them in the comments section below and we will do our best to answer them. Happy Paddling!